Most of the area around Mt. Rainier near Tacoma, Washington, is heavily forested, including the Copper Creek Inn in Ashford, where this bride and groom's wedding took place. During our portrait shoot, we went down to the edges of Copper Creek itself. 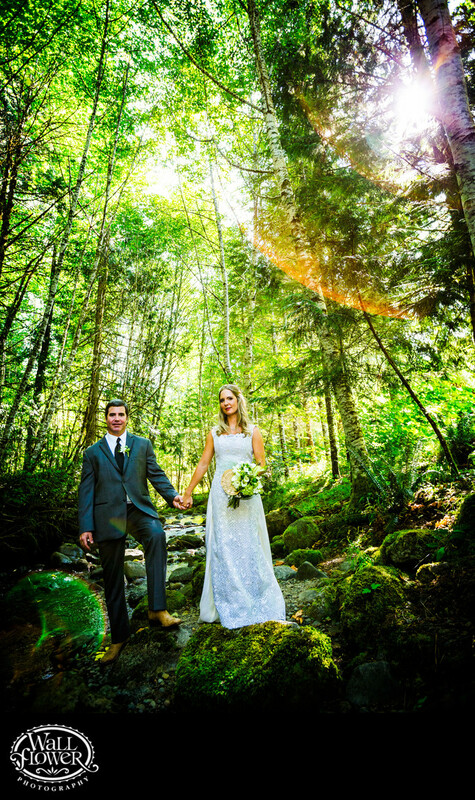 I let the sun filtering through the trees throw some lens flares as the bride and groom posed hand in hand on the mossy rocks in the mostly dry stream bed. It's dark under the trees, so I lit the bride and groom with my own Speedlites.